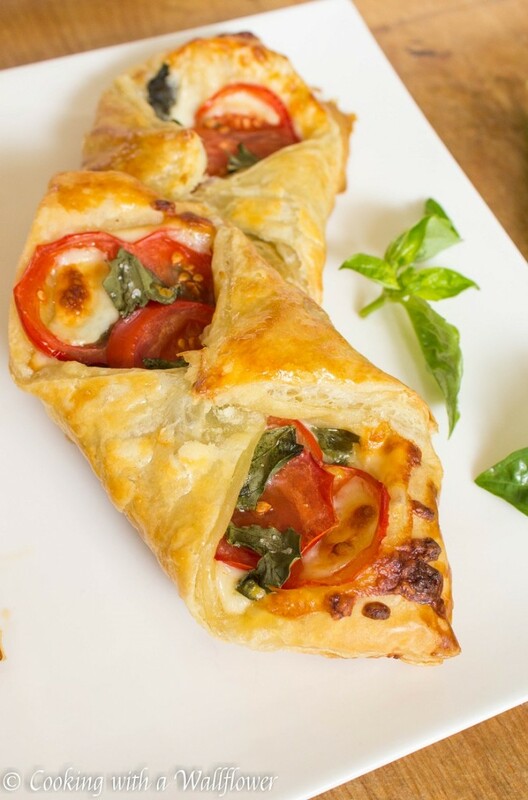 Puff pastries filled with fresh tomato and basil and melted cheese. 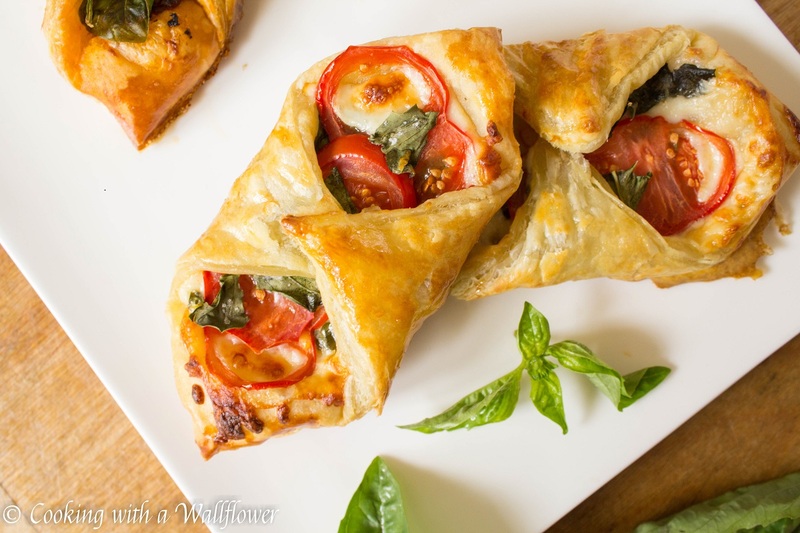 These tomato basil pastries are delicious and the best way to start your morning. How often do you eat breakfast in the morning? I’ve always heard that breakfast is the most important meal of the day, which makes sense since we need the energy to get us through the rest of the day. But waking up and getting ready for school or work, sometimes the idea of breakfast just doesn’t have its appeal. But these, these I can wake up for in the morning. These I can quickly make and reheat. I love tomato season. So many choices to pick from. Then paired with fresh basil and melted cheese. It’s a classic combination. But one I can never get tired of because they’re so fresh! Can you already smell these pastries baking in your oven? It’ll taste just as good. Promise. First, take out a puff pastry sheet from the freezer and allow it to thaw. You want the puff pastry sheet to thaw but you want them to remain chilled so that they will puff up better. 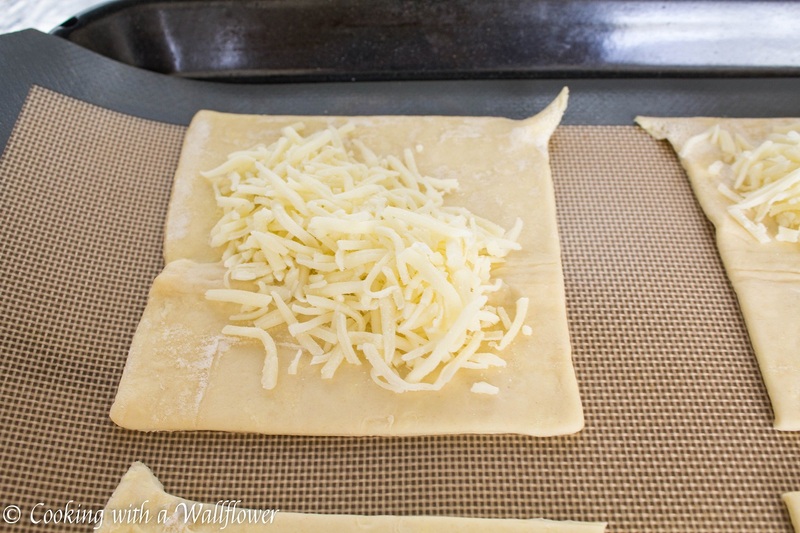 Once the puff pastry sheet has thawed, slice the sheet into four even pieces. Sprinkle about 2 tablespoons of mozzarella cheese onto the center of each of the squares. You can always add more if you like. Place the sliced tomatoes on top of the cheese. I used dry farmed early girl tomatoes, but you can use your favorite variety. Scatter torn fresh basil over the tomatoes. You can switch the order too. 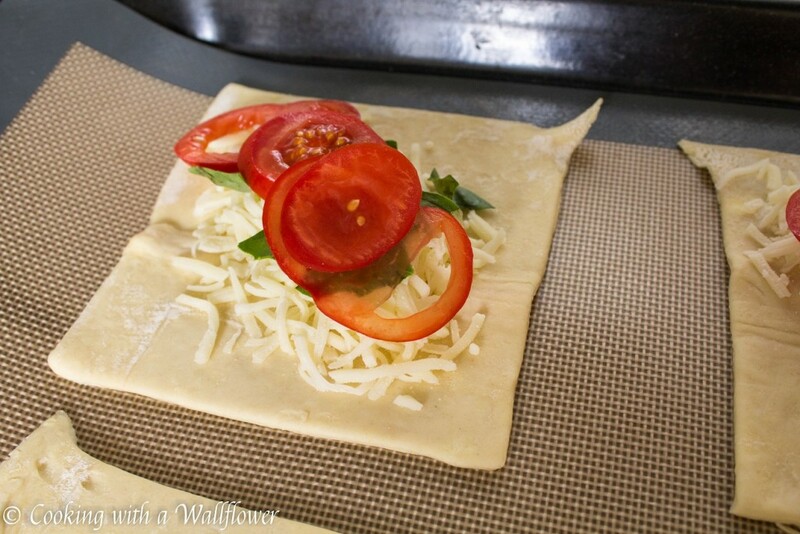 Fold two opposite corners of the puff pastry sheet to the center, then brush the pastry with the egg wash. The egg wash will help the pastry. Bake the tomato basil pastries in the oven for about 10-13 minutes until the pastries have turned a golden brown and the cheese has melted. Join me and other food bloggers at Fiesta Friday where you can discover new recipes. Once the puff pastry sheet has thawed, cut it into 4 even pieces. 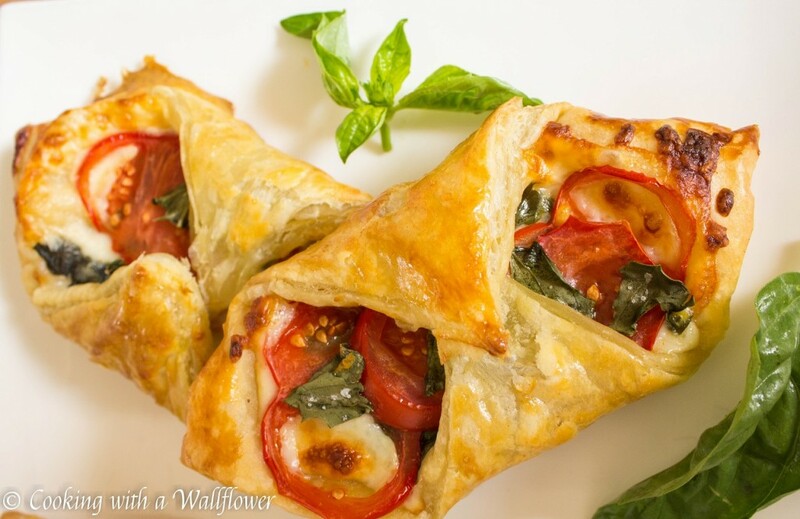 Sprinkle about 2 tablespoons of mozzarella cheese down the center diagonally of each puff pastry square. 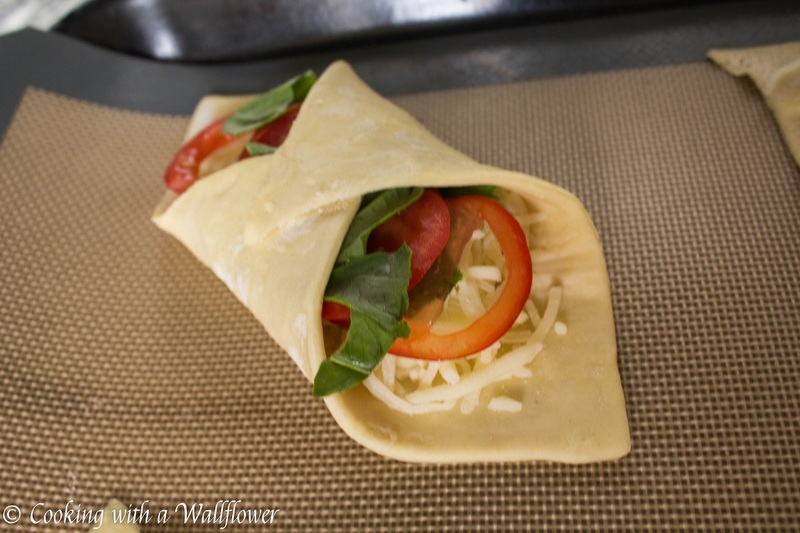 Top the cheese with slices of tomato and torn basil leaves. Fold opposite corners of the puff pastry squares to the center. Brush the beaten egg on the puff pastries to allow pastries to turn golden brown. Sprinkle salt on top if desired. Bake the pastries in the oven for 10-13 minutes until the pastries are golden brown and the cheese has melted. 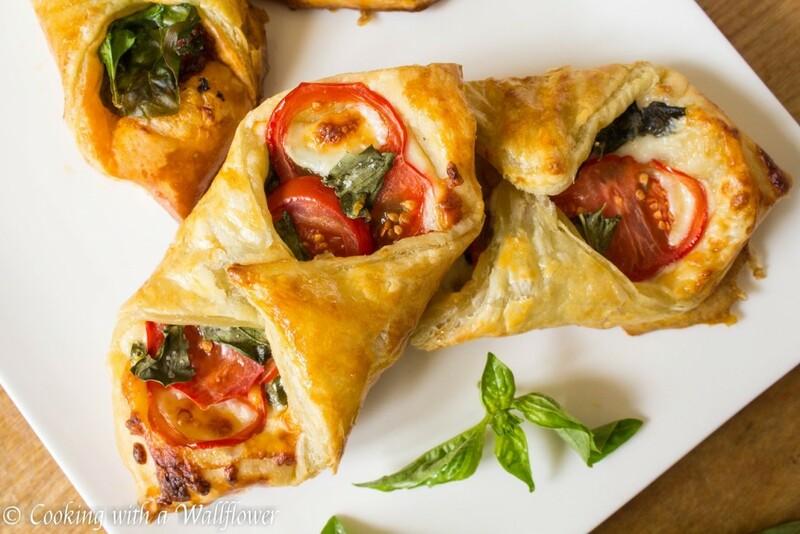 Serve the tomato basil pastries warm. This entry was posted in Appetizers, Breakfast, Farmer's Market, Quick and Easy, Recipes, Summer Cravings, Vegetarian and tagged appetizer, breakfast, quick and easy, vegetarian. It looks so good and appetizing! This look delicious! Really opened my appetite but it’s almost 12pm here 🙂 I love this sort of pastries with goat cheese too.